Raul Guerrero was born in Brawley, California in 1945 and grew up in National City, located twelve miles north of Tijuana, Mexico. He currently resides in San Diego, California. In the 50's and 60's, weekly family visits to Tijuana introduced him to a variety of Mexican folk arts and crafts imported from the interior of Mexico and all types of kitsch geared towards the tourist market like Da Vinci's Last Supper rendered in plaster of paris, or Cervantes Don Quixote and Sancho Panza carved out of pine boards. At the same time an incredible array of pop and sub-cultures were evolving in Southern California, including low riders, pachucos, surfers, beats, folk singers, motorcycle gangs, Hollywood culture and the newly emerging music scene inspired by British bands. This co-mingling of cultures and images was absorbed by Guerrero and would influence his artistic approach and content from this point on. 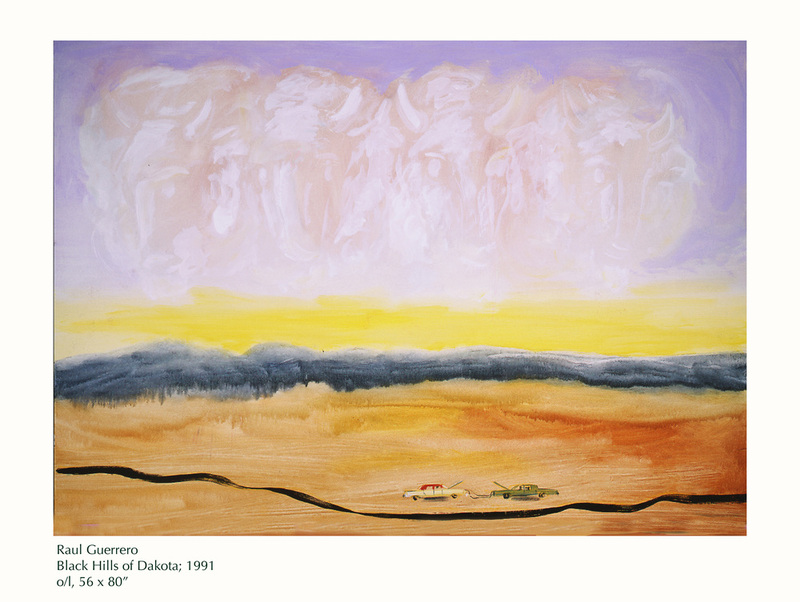 Guerrero attended the Chouinard Art Institute in Los Angeles, receiving his BFA in 1970. His first solo exhibition, in 1974, was at the Cirrus Gallery, Los Angeles. The exhibition featured, Rotating Yaqui Mask, an Indigenous artifact attached to a wall mounted motor rotating at 15 RPM; UFOLA, a photo composite of a UFO over the city of Los Angeles; Bird Bone Whistles, bird bones crafted into whistles and attached to an compressor to create sounds and photograms depicting obscene hand gestures with their Spanish translations. Similar works and exhibitions followed this initial show. In the 1980's, Guerrero shifted his focus from the conceptual experimentation of the previous decade to a more emotional, allegorical style using oil painting as the medium of expression. Oil painting allowed for the opportunity to create representations of thoughts and encountered situations using emotion and imagination more directly. In 1984, during a six-month artistic retreat in Mexico, he created the Oaxaca collection, the first body of work using this new approach to his art making. Over the last decade, the question of the reality and myth of the American continent has been the primary interest in his artistic content. The ongoing series,Problemas y Secretos Maravillosos de La Indias/ Problems and Marvellous Secrets of the Indies, examines American lands and their historical mythology. The project now includes three distinct areas of investigation: The Black Hills of Dakota, Latin America, and Southern California. Raul Guerrero has exhibited throughout California and his solo shows include the Long Beach Museum of Art (1977); Museum of Contemporary Art, San Diego (1989); Thomas/Lewallen (1978), Richard Kuhlenschmidt (1984) and Saxon Lee, Los Angeles (1989); Barbara Braathen Gallery, New York (1984); Quint Contemporary Art, La Jolla (1995); Galeria Ninapi, Ravenna, Italy (2005); and TRANSactions: Contemporary Latin American and Latino Art, MCA, San Diego (2006). He received an NEA Photography Fellowship in 1979 and the San Diego Art Prize in 2006. He is currently a Lecturer in the Department of Visual Arts at the University of California, San Diego. This exhibition at CUE Art Foundation marks Guerrero's first solo exhibition in New York in over twenty years. Allen Ruppersberg is a conceptual artist whose work includes paintings, prints, photographs, sculptures, installations, and books. Ruppersberg graduated with a BFA from the Chouinard Art Institute in Los Angeles. During his early years, he began significant relationships with John Baldessari, Ed Ruscha, William Wegman, and Allan McCollum, William Leavitt, Bas Jan Ader and Ger Van Elk. He participated in the groundbreaking 1969 exhibition, When Attitudes Become Form, and is recognized as a seminal practitioner of Conceptual art. Since the late 1960s, his work has been the subject of over eighty solo exhibitions and nearly 200 group shows, and can be found in permanent collections of museums internationally, including The Museum of Modern Art, Whitney Museum of American Art, Museum of Contemporary Art, Los Angeles, Foundation de Appel, Amsterdam; and Museum für Moderne Kunst, Frankfurt. He has been included in three Whitney Biennials, Documenta V, Lyon Biennale and Sculpture Project Münster, and has received a Guggenheim Fellowship and two National Endowment for the Arts grants. Ruppersberg lives and works in New York and Los Angeles. I'm 19 years old, a college dropout hitchhiking around Mexico and for some reason have ended up in Oaxaca. The Zocalo is surrounded by huge trees and has a bandstand serving as the center of gravity for the evening promenade, a mass of people circling people. Some in this throng are well dressed others not, some wear shined shoes, huaraches or simply go barefoot, hats no hats, clipped hair long hair, on and on. Kids run around chasing each other. Zapotec and Mixtec women wear gold and silver, selling trinkets and copper copies of jewelry discovered in ancient burial chambers. All the while la banda plays, waltzes, danzones or revolutionary period marching tunes. My art school girlfriend and I are hitchhiking Mexico and stop in Oaxaca. From our pension we can hear someone playing an ancient sound on a flute, a tune echoing the images we encountered that day in the ancient city of Monte Albán. Later in the Zocalo we sit on a bench observing the evening events. A man sitting next to us strikes up a conversation and after awhile asks if we would like to have lunch with him and his family. We accept the invitation. The next day we find ourselves in a remote village and eventually locate the adobe house. It has a corrugated tin roof and the dirt floor interior is recently swept and newly sprinkled with water. We have a simple lunch, and then taking me aside asks if we would please take his eldest daughter to the United States. He says poverty is making life difficult and he would like to give her to us. The bus from Teococuilco comes by at 8:10 AM, on its way to Oaxaca and the market. I get up and prepare for the trip into town to buy painting supplies. I make coffee, shower, dress, and open the bathroom windows overlooking the waterfall and stream running underneath the building. Formerly a wheat mill, it's now my painting studio and home for the next six months. The studio offers a panoramic view of the valley below, the sun is reflecting off of slow moving clouds, and the distant mountains are obscured by a light rain. The bus finally arrives. It looks circa 1947, is painted bright yellow with blue trim, worn tires are covered in mud and the name El Llanero Solitario (The Lone Ranger) is written in Old English script on the side. The bus door opens to the blare of Mexican music. I step up and make eye contact with as many people as possible, and offer a greeting. A few respond, most are asleep as they have been on the road since early morning. The passengers are mostly children, and shawl wrapped women with bundles of goods, they are strongly indigenous looking, probably Zapotec. When I decided to nominate Raul Guerrero for a slot on CUE Art Foundation's exhibition program, I suggested showing his series of paintings begun in 1984 in Oaxaca, Mexico, because I had never quite forgotten them. They were his first foray into painting and have remained unique - at least to me - throughout his subsequent career, which has mostly focused on painting, and in particular, painting a sense of place. This series had never, to my knowledge been shown together, but had been painted as a group and in a consistent and original style. That style might be defined as primitive but not naïve, with a touch of magic realism from the time and incorporating a narrative feeling of space coming from his sculptural tableaus of the past. The elements that made the sculptural environments stand out had passed into the paintings. His current work has grown into something more sophisticated or knowledgeable most would say, myself included, but I am also still thoroughly attracted to those first efforts. I selfishly wanted to see them all together at least one time. I first met Raul at the Chouinard Art Institute where we were both students in the mid 1960's. It was a decade later, however, when we coincidently found ourselves living in the same apartment building in Santa Monica, that we became close friends and that I began to know more completely his work and ideas. 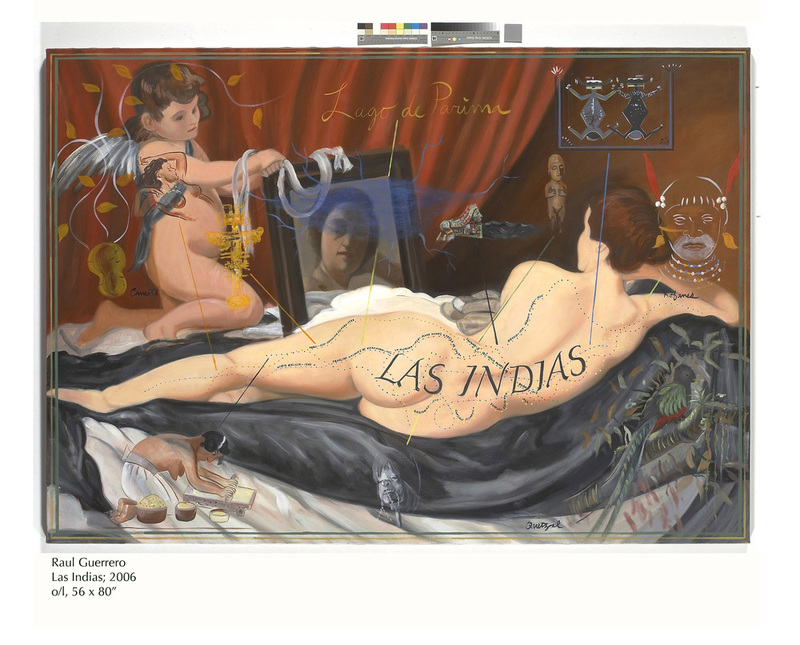 Raul's art at the time was a formally mixed approach of the interdisciplinary kind characteristic of this period. Centering primarily on sculpture, it included film, video, photography, found and appropriated objects often placed in a kind of tableau, drawing, and prints. There was a specific, conceptualized slant to these combinations that was familiar to me, beginning with a sort of Duchampian Dada and incorporating strains of surrealism, outré (at the time) painters like Raul Dufy, kitsch illustration, and the general detritus of Spanish and American cultural history that he found growing up in the San Diego area of Southern California. Then in 1984, as he has told me, he tired of trying to infuse these by then mostly straight ahead sculptural projects with the emotional world he was living in. He decided to try to render this world in paint rather than objects and chose as his first subject the Mexican city of Oaxaca. This was to initiate an interest in painting cities and a certain range of subjects that continue to occupy him to this day. I think of this early effort in Oaxaca as the touchstone of what was to come later and what was to embody, for him, some of the best thoughts in a new/old medium.